The non-alcoholic beverage market is the fastest growing segment of the functional food industry worldwide. Consistent with beverage consumption trends generally, the demand among consumers of these products is for high-nutrient drinks made from natural, healthy ingredients, free of synthetic preservatives and artificial flavor and color enhancers. Such drinks require specialized knowledge of exotic ingredients, novel processing techniques, and various functional ingredients. The latest addition to the critically acclaimed IFST Advances in Food Science series this book brings together edited contributions from internationally recognized experts in their fields who offer insights and analysis of the latest developments in non-alcoholic beverage manufacture. Topics covered include juices made from pome fruits, citrus fruits, prunus fruits, vegetables, exotic fruits, berries, juice blends and non-alcoholic beverages, including grain-based beverages, soups and functional beverages. Waste and by-products generated in juice and non-alcoholic beverage sector are also addressed. 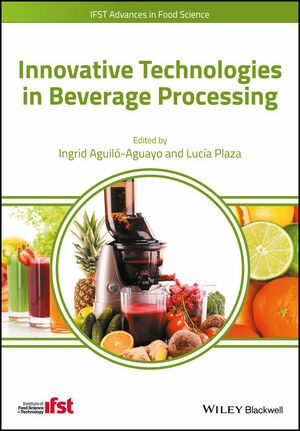 Innovative Technologies in Beverage Processing is a valuable reference/working resource for food scientists and engineers working in the non-alcoholic beverage industry, as well as academic researchers in industrial food processing and nutrition.